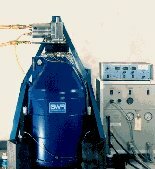 The GGP (Global Geodynamic Project) is a long term initiative in order to establish a world wide network of super conducting gravimeter (SG) stations by the voluntary consolidation of unique observatories using such devices. The first phase of the project ran from July 1997 to July 2003, the second phase until 2007. The third phase continuing this project will last until 2011. The high accuracy gravity data are used for study of global motions of the entire Earth as well as for the estimation of local gravity effects caused by atmospheric pressure and groundwater. By the start of high accurate satellite gravity missions CHAMP and GRACE, the SG data got a new impact for the validation and calibration of these missions. Product Types Please note, you need to be logged in to access the Retrieval-Pages (Get Data). GGP-SG-AUX Auxiliary Data Ancillary observations at SG station, e.g. hourly data of precipitation, humidity, air temperature. Quantities vary with station. GGP-SG-CORMIN Corrected Minute Data Gravity data decimated to 1 min and processed either by station operator or by staff at ICET and atmospheric pressure at site. Details see Data Repair Code. GGP-SG-EARTHQ Earthquake Data GGP Earthquake Data: SG data from special earthquake events for a period of 1 week following the origin time of the earthquake. Raw data are either provided as 1 min data or as second data. GGP-SG-HOUR Hour Data Processed gravity data decimated from 1 min to 1 h. Processing done either by station operator of by staff at ICET and atmospheric pressure at site. Details see Data Repair Code. GGP-SG-MIN Minute Data Gravity data as recorded decimated to 1 min without prior repair and atmospheric pressure at site. GGP-SG-STATLOG Station Log File Log files containing information on events which might affect the observations.